The powerhouse Cincinnati club, popularly known as the "Big Red Machine," entered the World Series after winning 108 regular-season games and sweeping Pittsburgh in the National League Championship Series. All that success didn't help them in Game 1, however, as colorful Red Sox starter Luis Tiant allowed just five hits while beating the Reds 5-0. The Sox looked to take two straight in Game 2, but the Reds came up with a pair of runs in the ninth and a 3-2 victory. Boston turned the tables in Game 3, tallying a pair in their half of the ninth to tie the game at five apiece, and force extra innings. In the bottom of the 10th, with nobody out and a runner on first base, pinch-hitter Ed Armbrister attempted to lay down a sacrifice bunt. On his way to first, he got tangled up with Red Sox catcher Carlton Fisk, who then threw wildly into center field, leaving runners on second and third. Fisk claimed interference, but plate umpire Larry Barnett let the play -- forever after known as "The Armbrister Incident" -- stand. An intentional walk and a strikeout later, Joe Morgan ended the game with an RBI single. Tiant, winner of Game 1, again took the hill in Game 4, and again he was up to the task, pitching a complete game. He did allow pairs of runs in the first and fourth frames, but the Red Sox hitters scored five runs in the top of the fourth, and it ended 5-4 Sox. 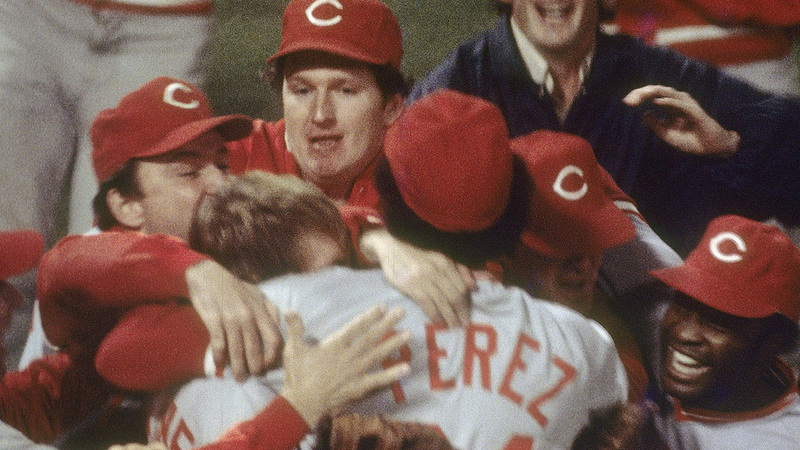 The Reds left Cincinnati on an up note, capturing an easy 6-2 victory in Game 5 behind a pair of homers from Tony Perez. Then, Game 6. Fred Lynn's three-run homer in the bottom of the first inning gave Boston a 3-0 lead, but Cincinnati took a 6-3 lead with three runs in the fifth, two in the seventh and one more in the eighth. Bernie Carbo erased that deficit with a three-run homer of his own in the bottom of the seventh, and after 11 innings it was still 6-6. Carlton Fisk led off the bottom of the 12th and, in a moment immortalized by TV cameras, he hit a long drive down the left-field line. With Fisk apparently "willing" the ball fair, it carried the Green Monster for a game-winning home run, sending the Fenway faithful home happy. In Game 7, the Sox took a 3-0 lead in the third on Carl Yastrzemski's RBI single and a pair of bases-loaded walks, but they would score no more. Meanwhile, Tony Perez hit a two-run homer in the sixth, and Pete Rose tied the game in the seventh with a run-scoring single. In the top of the ninth with two outs, Joe Morgan came through with his second game-deciding hit of the Series, this one a single that scored Ken Griffey to give the Reds a 4-3 edge. Will McEnaney came on to retire the Red Sox in order in the bottom of the ninth, and Cincinnati had its first World Series since 1940.